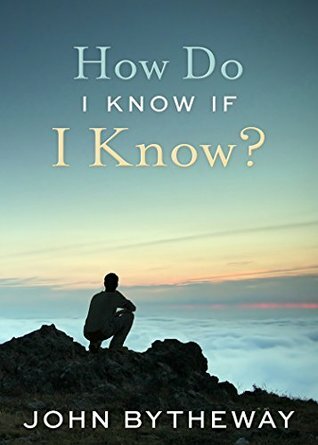 Open Book: Review: How do I Know If I Know? John Bytheway, besides having the cutest name since Picabo Street, is a fantastic speaker on LDS matters. No matter what subject he tackles he always inspires and uplifts his readers/listeners. I have been away from the church for quite awhile and so my testimony is shaky. I have been reading books on faith and questioning everything I believe. Some of the books I've read during this time have been full of information and were valuable for expanding my world view. Others were solid books on doctrine and belief. None of them made me feel as much as this little book for teenagers seeking to know if they have a testimony or not. I guess I'm just a teenager at heart because I got more out of this book than all of the others combined. I loved that Bytheway (still loving that name) talks about the logic and not just the emotions of faith. Over the years I have come to recognize that I may never have a burning in the bosom or some great sense of spiritual matters. I can be intuitive, but I prefer knowledge over emotion. Since I live with depression and anxiety I know that emotions are iffy things that can have little connection with concrete reality. I have learned, because of my depression, not to trust what I feel because my brain chemistry loves to mess with me. However, if I can learn facts and use that as a basis for faith, then I'm a lot happier, and this book validates that as a perfectly acceptable approach. I came away from this book reassured and encouraged. You can't ask for more in a book of this type. Five grateful stars.